Non-API lubrication systems are an essential product and service that ensures reliability throughout the plant by providing lubrication to rotating equipment such as main journal bearings‚ generator bearings‚ reducing gears‚ and accessory gears. OEM’s and plant operators who are looking to ensure the plant operates at peak efficiency and reliability will specify lubrication systems for each piece of rotating equipment. Depending on the system requirements‚ other items such as oil purifiers or rundown tanks may also be required. 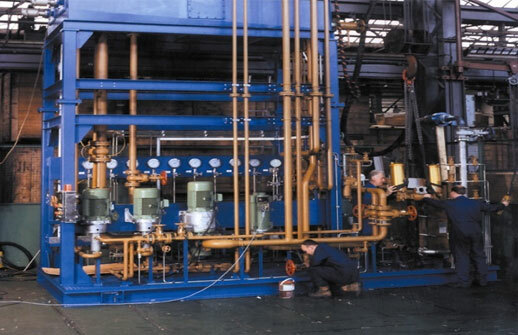 Lubrication systems in power plant applications are typically installed with the pumping systems mounted in a vertical configuration‚ with a primary‚ standby and emergency backup. Occasionally‚ the lubrication system is configured with the control oil system‚ taking the number of pumps in the system to five. For steam and gas turbines above 50MW‚ where flow rates are significantly higher‚ the preferred pump is a centrifugal pump such as the Allweiler branded NSSV series. Turbines‚ diesel engines and compressors units below this output range are supported with either three-screw or gear pumps. CIRCOR has over 3‚000 lubrication systems installed throughout the world supporting the operation of rotating equipment in markets such as Power Generation‚ Oil and Gas‚ and Commercial Marine.